The six SJ-06 series satellites in Earth orbit. A Chinese satellite may have intentionally nudged another spacecraftduring secretive space maneuvers in near-Earth orbit, according to analysts. Such close encounters could allow China to practicerendezvous procedures between its futurespace station and other spacecraft, as well as learn about satelliteformation flying, said Brian Weeden, a former U.S. Air Force orbital analystand now technical adviser for the Secure World Foundation. The satellite rendezvous tests could also permit close-upinspection of another satellite, not unlike demonstrations performed by the United States and other countries in the past. The satellite's behavior does not fit the profile for an anti-satellitetest, Weeden wrote in an analysis for Space Review. But he addedthat the mysterious nature of the test could have an effect on perceptions oftrust and safety in space activities. "There's no evidence there was any damage to thesatellite or debris, so I wouldn't characterize it as a collision," Weedentold SPACE.com. "More like a bump." SJ-12 launched on June 15 from Jiuquan Satellite Launch Center in China. That launch center has also served as the starting point for China's manned spaceflights on Shenzhou spacecraft in 2005 and 2008. Weeden said the SJ-12 satellite's first moves allowed itsorbital plane to eventually match that of SJ-06F over the course of 50 days.The latter mission consists of a pair of satellites, including a smallermaneuvering satellite and a larger satellite. One of the closest passes between SJ-12 and SJ-06F created achange in SJ-06F's orbit on the night of Aug. 18, according to public data fromthe U.S. Air Force. SJ-12 also made many close approaches with less than 984feet (300 meters) between the satellites. "As far as we can tell, SJ-12 is still doing a bunch oflittle maneuvers close to SJ-06F," Weeden explained. 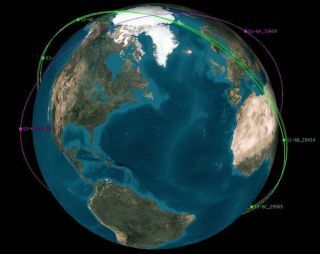 NASA previously experienced its own satellite bump when itlaunched the Demonstration for Autonomous Rendezvous Technology mission onApril 15, 2005. That DARTmission was supposed to demonstrate automated rendezvous with a defunctU.S. Navy MUBLCOM communications satellite. A navigation error led to DART and MUBLCOM bumping at aspeed of 4.9 feet per second (1.5 meters per second) — fast enough to cause a majorchange in the MUBLCOM satellite's orbit. The orbital change for the MUBLCOM satellite was about 100times greater than the change in SJ-06F's orbit, Weeden points out. Thatsuggests the Chinese satellites most likely did not suffer any damage duringtheir presumed bump, if that happened. The SJ (Shi Jian, or "practice" in MandarinChinese) satellites typically conduct what the Chinese government has termed"scientific missions." But some outside observers believe the satellites actually receiveelectronic signals for the Chinese military. They point out that no scientificresearch based on the work of the satellites has ever appeared. China has good reason to want to experiment with close spacemaneuvers, given its plans to build a space station that would require continousresupply. Still, the lack of official Chinese information about the maneuvershas certainly allowed room for speculation. First notice of the satellite bump came from Igor Lissov, awell-respected Russian spaceobserver. Russia's Interfax-AVN news service quoted him in a story onAug. 19, and China's state-run Xinhua news agency later picked up the story. The Russian story suggested that the Chinese space maneuversmay point to the possibility of inspecting both their own satellites andperhaps foreign spacecraft. Of course, the U.S. is no stranger to mysterious spaceactivities. The U.S. Air Force's mysteriousX-37B space plane has drawn plenty of speculation since launching in April. But the X-37B likely represents an orbitalspy rather than a space weapon,?Weeden said.